In the springtime, homeowners often turn their thoughts to clearing extra clothing, toys and household items from their homes. If you have a lot of stuff you’d like to be rid of and would like to use it to make a little extra cash, a yard sale may be the answer. However, to maximize your efforts, you need to go about it the right way. 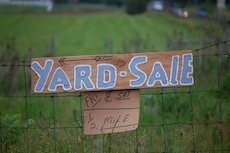 You’ll increase your chance of yard sale success if you follow these 13 tips. 1. Avoid holidays and long weekends when there may be community events or people are apt to be away. Pick a day that falls near the first or the 15th of the month, when people are usually paid. 2. Start preparing about two weeks in advance of the yard sale. Gather things you no longer want or need from every room in the house and collect it in a basement or spare room “staging area.” Make sure everything is clean and organize items according to function, i.e. kitchen, toys, books and music, etc. 3. Use preprinted price tags (you can get them at dollar stores) or painter’s tape to price everything. Painter’s tape won’t leave a mark on things and won’t tear book covers. 4. Advertise your yard sale on Kijiji and Craigslist. 5. Apparently, covering the tables you’re using to display your stuff with colorful table cloths works subconsciously to make shoppers think that your stuff is worth the price you’re asking. At the very least, it makes your tables look unified and clean. 6. Display jewelry on a fabric or blanket that shows it off to best effect. 7. Group things like they do in department stores to make for easy browsing and avoid sitting merchandise on the ground. Eye-level is best. 8. Grab the attention of passers-by by putting eye-catching items near the road. 9. Offer a “free with purchase” box filled with small toys like balls, stuffed animals and bags of loose crayons. It’s a great way to get rid of odds and ends that can’t otherwise be sold. If, like me, you get a lot of charity greeting cards in the mail, you know that it’s impossible to make use of all of them, so this would be a great time to bundle them up by theme (birthday, thank-you, get well, blank, etc.) and just give them away to whoever wants them. 10. If your selling electrical items, people will want to test them to make sure they work, so it’s a good idea to have an extension cord and batteries handy. You may also want to have a tape measure, calculator and some string on hand. 11. Boxes and bags will make it easy for your customers to carry their purchases away and elastic bands are great for keeping box lids shut for transport. 12. Start out with an assortment of coins and small bills for making change. I like to use a fanny pack to keep money in so that cash is never sitting unattended but a lidded box will do the job, too. 13. Inevitably, there will be things left over from your yard sale. Rather than haul it all back inside the house, fill your car’s trunk with whatever didn’t sell and take it to the nearest Good Will or Salvation Army drop-off. At the end of the day, you’ll have gotten rid of a lot of stuff your family no longer needs, made a little extra money and done some good for others, too. I’m not a big fan of yard sales. It just seems like a lot of work for little reward. Last time we had one we made around $200, but when you add in the time my wife and I spent doing it it worked out to like 8 bucks an hour. Plus I had to deal with hagglers trying to talk me down from 50 cents to a quarter. I guess I just don’t have the patience for it. Nice one, you have come up with great list. To increase sales and coverage of interested people, I suggest doing a “group” yard sale. Inviting two more families is a good start. And your advertisement effort is multiplied by three(considering three families).